Volgens jaarlijkse gewoonte ontmoeten de Loesje leden elkaar in het paasweekend voor een bruisende ledenweek. Van 21 tot 25 april verzamelen zowel Nederlandse, als Belgische enthousiastelingen in Mont (Comblain-au-pont, Luik) en jij bent ook van harte uitgenodigd. Het maakt niet uit of je Loesje-ervaring hebt of niet. Iedereen is welkom om de sfeer op te snuiven en Loesje persoonlijk te leren kennen. Do you want to do EVS in Berlin at the international Loesje office? We are looking for two creative and motivated people to do European Voluntary Service (EVS) at the international Loesje office in Berlin for 12 months. EVS is a project of the European Commission and it means you can live for free in Berlin, do society-committed work and enjoy life, if you are under 30. Regulations you can read below. Loesje is an idealistic organisation which aims for a creative society based on own initiative and active citizenship. The objective is to exchange ideas and opinions, to stimulate people to create their own ideas. Loesje mainly uses posters with short but strong texts (one-liners), which shine a different light on particular subjects. Our main activity is to create such posters, together with our members, as well as with people from other organisations. The posters are spread on the internet, around the streets, in community centres, schools etc. The aims of the organisation are to spread black and white posters to colour life and to create possibilities, in which participants of Loesje activities can constantly start and support progressive social initiatives. The project will start on the 1st of September 2011 and will last until the 31st of August 2012. It will be a great experience! At our office you will be working together with Rola (SE), Artur (PL) and interns from different countries, as well as many other active people of Loesje. Accommodation is arranged and for free, we have a cosy EVS flat where you will live together with the other EVS volunteer. You get money for food and pocket money, insurance, a German language course and a bike. The atmosphere at the office is informal and there is a lot of space to come up with your own ideas. A mentor, as a personal guide will be present during your EVS year, although we encourage self-initiative, because an active attitude is essential for the work we do. First read the regulations and selection criteria. If you have any questions, feel free to ask us. One advice, in case you know the people at the international office of Loesje, pretend you don’t know them. What you write is very important to us and not what you believe that we know of you. It’s better to write more than to give too less information. The deadline for applying is the 01st May 2011. We will inform you as soon as possible, if you are selected or not. How to improve the web presence of Loesje International? Missed the board meeting and assembly? Interested in the discussed topics? Do you want to know more about our plans? Would you like to share also your ideas about Loesje's future? We're happy to inform you that we are going to publish short summaries about the meeting, so you will have the chance to take part in it virtually and share your comments with us. On a sunny Saturday morning, on the second day of the assembly twenty friends of Loesje gathered together in the international office in Berlin to share their ideas about the improvement of Loesje International's web presence. The presentation was held by Artur and Petra, who started with the evaluation of Loesje International's web activities. They analysed the growth of the organisation on social media (facebook, twitter) and evaluated the activities of the website (online voting list, online bulletin). In 2010 there were 52.345 visits on www.loesje.org. Our facebook page was set up in September 2010 and since then has received 2188 lifetime "likes", 1695 of them are monthly active users. We observe a stable and constant growth of ca. 7% per week. In October 2010 we started our twitter profile and acquired 1647 followers since then. We are listed 30 times. Goal: an interactive and playful website with more content. for example: a map highlighting the active Loesje countries with a short description and photos, contacts of the Loesje International office, introduction of Loesje on the front page etc. getting rid of old and unused content and functionality. promotion of the new content on facebook and via our newsletter. short films about text writing workshop, final editing, poster sticking etc. video clip out of photos of Loesje posters from all around the world. The assembly is planning to have an evaluation of the the new website content in the summer camp of Loesje in Estonia (22nd July - 02nd August 2011). To be able to improve our website, we also need you, your ideas, comments, photos or articles on any topics what you think would be interesting for Loesje and her friends. Thanks for keeping Loesje's international network active! Wist je dat het mogelijk is om een jaartje voor Loesje te werken in Nederland? Dat je huisvesting en eten dan gesubsidieerd wordt door de Europese Commissie? Al jaren werken er gemiddeld twee buitenlandse vrijwilligers via EVS voor het Loesje-kantoortje in Arnhem (NL). Het liefst bieden we plek aan iemand die de Nederlandse taal machtig is, zodat het samenwerken en samen schrijven makkelijker gaat. Er zit echter één regeltje aan: alleen mensen tot 30 jaar komen in aanmerking voor EVS. Je hoeft zelf de subsidie niet aan te vragen, dit doet Loesje voor je. Je werkt 4 dagen in de week aan Loesje. Je wilt dit voor een jaar doen, van september 2011 t/m augustus 2012. Woonruimte en verzekering is gratis en wordt voor je geregeld, en je krijgt ook zakgeld voor zaken als eten en kleding. Je werkt in een team van zo’n 8 mensen aan Loesje in Nederland en België. - Taken in overleg, maar te denken valt aan tekstschrijven, posters plakken, producten maken, informatie materiaal maken, film- en discussieavonden en andere activiteiten organiseren, acties, schrijfworkshops geven en meedoen aan creatieve (internationale) projecten. Voor informatie over wat EVS nou is, kijk eens op www.youthinaction.nl en klik op EVS. (Dit is eigenlijk een site voor Nederlandse jongeren die naar het buitenland willen, maar wel goed voor de indruk van wat EVS is). Geef je interesse uiterlijk door op 21 april. The NEW Loesje handbook is here! If you want to translate the handbook into your language, just email us and she will give you more information! The handbook will soon be available in Polish, Spanish and Hebrew. Volunteers for translations into other languages very welcome! The idea of the international training is to train 24 already experienced participants in arts, media and communication, using workshops to create a common understanding of the festival concepts and create the group work atmosphere, and practical »field work«, with an accent on peer to peer education and communication work. The training and its participants will at the same time be the media team of the Oddstream festival, creating synergies with it, and report from it, partly in collaboration with local media. Deadline for applying is 4th of April. 24 participants (no age limit) who has already experience in written media and/or video. Participants must be residents of an EU country and can travel from all EU countries. People will be hosted either at a hotel in nearby Nijmegen, or in huts with proper beds at the festival camping. The reimbursement of travel costs will be done via bank transfer. Partners in the training are Inca Italia (IT), Pink Sweater (NL), PINA (SI), Loesje International (DE/INT) and Mašta (DE/INT). The project is funded by Youth in Action Programme of the European Commission. Today, Loesje International is having a text writing workshop on the theme of feminism. In the Poster Archive, you can find an already existing series on the subject. The way people deal with this day, sure does create a debate. One day a year, it exposes how gender-norms are questioned or if they are questioned at all. Here is an article related to the subject of Loesje addressed as a girl. Leave your comments and reactions for further debate. This is possible today and the rest of the year. Loesje recently turned 27 years old, but is still very often referred to as a girl. Even though Loesje is very independent and travels all over the world, where she initiates so much, and engages with many people, this descriptor confines her to the status of a child. She is not the only one who has this problem. Many women who are clearly years beyond the ages of puberty, are often referred to as girls. The belittling of an independent and active person that such a descriptor produces does not remain static, but also has an impact on the behavior of the designated person. In other words, the more media, language and education support the idea that women should stay childish, the more of an impact it has on the minds of many girls, and limits them in their exploration and engagement with themselves and the world. They learn to pay less attention to what they want, and more to how they would like to be perceived. Innocent, passive and harmless. Stereotypes? Perhaps. Let's consider the medium of advertisements for example. How often are girls and women presented in poses that make them seem smaller, so that they don´t occupy so much space. How often are they seen holding on firmly to objects or other people (mostly men or boys), creating thus the impression that they can not stand alone. Unable to engage alone, and hence always dependent on the help of others. How often do we see eerily thin bodies of girls and women, so that it gives us the impression as if they are almost disappearing from the surface of the picture – as if they don´t belong there at all. Exaggeration? Not really. But back to Loesje and the question of why girls are still called girls, even when they've been referring to themselves as women for a long time. Well, maybe the idea behind this naming is that they should never grow up. Instead they should always remain small and invisible, and not take up so much room. Not talk too much, but listen to others – not interrupt too much, even though they are often interrupted themselves. Language here is a powerful product – literally. It creates and regulates power structures. It makes it possible to perceive the world, order experiences and understand them. Language is always integrated into social relations – it reproduces everything that is seen as a norm. It can confirm dominating images and norms, or change them and break them. When people in the minority or in an undesirable/unprivileged position are devalued or oppressed even in the language, there can be no real change in how this group is regarded. Not name a group means to not think about them. Never girls again. Well, not entirely. Many women like referring to themselves as girls, but dislike it when others do so. Descriptors are always embroiled with and in social positions – it is always about the issue of: who is speaking, and from what political/societal/privileged/minoritized point of view. Others appropriate the term, by taking the marginalizing term and all that it entails, and use it to name themselves – similar to the terms 'queer' and 'black', that became empowering through subversion. The political/musical riot grrrl movement, along the same line of thinking, empowered women to go on stage and claim it for themselves, as opposed to leaving it to their male colleagues. The term grrrl – not least because of the three 'r's – is undermined and re-conceived. Many female artists play with the stereotyped attributes that are generally ascribed to girls, question them and transform them in radical ways for themselves. So what would Loesje do? How would she refer to herself? How about simply Loesje? Not Loesje is a young girl, who has already completed 27 years – but Loesje is a person, a group, a figure, a character – perhaps also you? And then Loesje can choose who to be – girl or woman or even boy or man – who knows? Everything is possible. En nóg een posterserie deze maand. Je vindt deze en andere posters in het posterarchief. Print uit, hang op, deel uit! 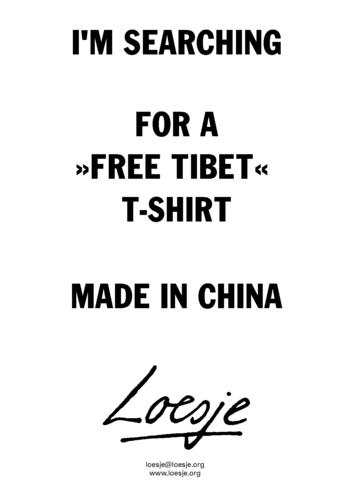 Loesje International asks a favor from you. Please vote for this Loesje text, if you want to see it printed on threadless t-shirts. Thanks for your vote in advance! De schrijfbijeenkomst in Brussel had gevolgen: 5 nieuwe posters zagen het levenslicht en schreeuwen om adoptie. Je vindt de posters in het posterarchief. Print uit, hang op, deel uit!